[T]he manual shift knob came off mid-gear-change! Not only that, the shifter boot and the ring toggle at the manual shifter’s base came off with it. But Mini has responded with a fix and then some. We recently received a notice from Mini, alerting customers that it is aware of the issue. It explained the exact problem that we encountered, including the assurance that the transmission will still operate using the remaining metal stock. To fix the issue, Mini is reattaching the shifter and boot, but with an instant-bonding adhesive. This should hopefully keep the shifter from flying free again. We commend Mini on addressing this issue with a quick fix. 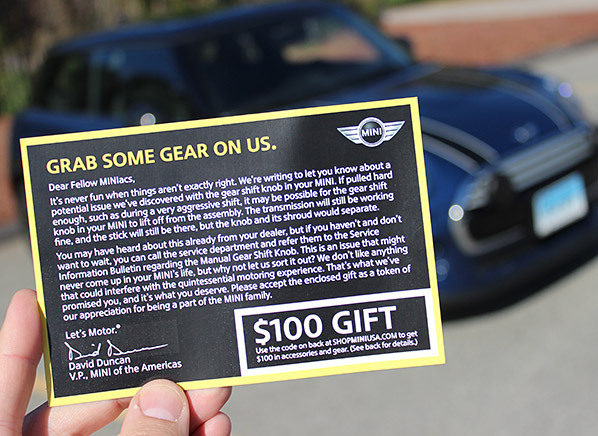 And Mini even went a step further, offering $100 to owners for Mini’s online store.